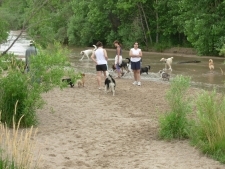 Dog parks are WONDERFUL places where your dog can socialize and play with other dogs. They are also great places for people to socialize with other dog people. BUT ARE DOG PARKS GOOD FOR ALL DOGS? As our dogs guardians we have an obligation to them. We need to better understand our dogs and learn how to interpret their body language. As wonderful as dog parks can be, they can also hold the potential for conflict and consequences. KEEP YOU’RE EYES ON YOUR DOG AT ALL TIMES! Pay attention to your dog at the dog park. Be ready to accept that your dog may not be an appropriate dog to be in the dog park or may not enjoy the company of other dogs or that many other dogs. 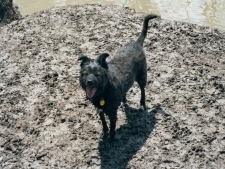 Dog parks are great fun for SOME dogs and are a nightmare for others. IS YOUR DOG BEING A BULLY? You may think, “He just plays rough.” Look at the dogs your dog is playing with, if they aren’t enjoying it, your dog is being a bully. Dogs are great at communicating their discomfort and fear. A dog who behaves appropriately will respect that another dog is uncomfortable and either leave the dog alone, or ease up. If your dog does not do this, then your dog is being a bully. Take responsibility and either remove your dog from the park or at least make him back off of the dog he is bullying. IS YOUR DOG AFRAID OF THE OTHER DOGS? Dog parks can be too overwhelming for some dogs. Is her tail tucked and ears back? Is she constantly on her back? Does she feel like she has to defend herself from the other dogs, by growling, snapping or barking? Does she spend the whole time under the picnic table or behind your legs? If so, maybe the dog park isn’t a HAPPY place for your dog. Maybe your dog would rather go on a walk or hike with you, or play a rousing game of fetch, or learn something fun like agility. You can NOT force a dog out of being afraid, yelling at them for snapping at another dog or “rolling” them on their back to make them “accept” another dog, will only exacerbate the problem. It will also reinforce to them, that the dog park really is a scary place! We take our dogs to the dog park because we want them to have FUN, so let’s make sure they are really having fun. ENCLOSED FENCED IN DOG PARKS OR OFF LEASH OPEN SPACES. Everyday there are more and more fenced in dog parks opening up, they are great places to let your dog off leash without the fear of losing them. But a lot of times they can be very overwhelming because the dogs are concentrated in a small space. They are great places for dogs that are happy go-lucky and like to play with other dogs. For dogs that are a little more reserved, nervous, and older or puppies and small dogs they can be stressful and not fun at all. If you are fortunate enough to live in an area where there are off leash open spaces and trails, then these are what I recommend most. In an open space the dogs can still play with other dogs but you can always walk away if there are dogs that are being too rowdy. Open spaces are the best for those dogs that are more nervous or older and for those that are not too interested in playing with other dogs but are fine passing by and saying hello. 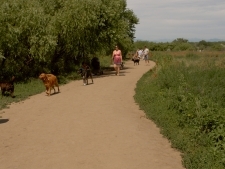 Open spaces or trails are great places to socialize and exercise your dog without having a concentration of dogs in a small space. It is very important that every new experience a puppy has be a positive one. It can be very traumatizing for a small puppy to be run over or barked at by a large dog. If this happens within one of the puppy’s fear stages it can cause permanent issues for the rest of the dogs’ life. Some small dogs think they are big and are perfectly comfortable around larger dogs. But for a lot of small dogs having a 100 lb dog coming at them can be very scary! Plus there is always the possibility of them getting hurt. Again watch your dogs’ body language, if he is uncomfortable take him away! For puppies and small dogs, use the small dog areas if available! A dog park is an exciting environment but you don’t want to see out-of-control dogs or situations. Watch other dogs and dog owners carefully, if you see an aggressive dog that’s not being managed by his or her owner, play it safe and leave the park. 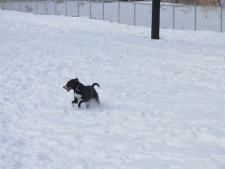 Dog parks provide a fantastic opportunity for off-leash play when owners are alert and conscientious. Few things can happily tire out your dog like a fellow canine playmate. With a few precautions, your dog can have a wonderful time with the only telltale signs being a sleepy, tired and maybe, dirty dog!